December 5 2018, 5:16 p.m.
Keith Shenery was hanging out with friends in the courtyard of a Harlem public housing project when police saw him remove a small bag from his pants. When police approached him, he told them that it was “just weed.” When the officers searched him, they found a small bag of marijuana and a folding knife, a gift from his grandfather. Shenery, 21 at the time, was arrested and indicted for unlawful possession of marijuana and felony possession of a weapon — an unusually severe charge. Prosecutors asked for his bond to be set at a whopping $10,000. Shenery, they claimed, was a “known” gang member. Shenery, who had only three nonviolent misdemeanor arrests on his record from when he was a teenager, could have been released that night on his own recognizance with a misdemeanor charge. He had no idea why prosecutors would call him a gang member and strongly denied the accusation. But as his case has dragged in court for nearly two years, prosecutors labeled him a gang member over and over — telling a judge, but providing no evidence, that he belonged to Harlem’s Cash Money Boys, “a violent narcotic sale crew based out of 1990 Lenox,” according to court files. As The Intercept has reported, the NYPD’s gang database was massively expanded in recent years, even as gang-related crime dropped to historic lows. The information on the secretive list is available to prosecutors but not to those named in the database, who often learn that the police have labeled them gang members only if they are arrested and slammed with inexplicably harsh charges or excessive bond. The database has been widely criticized as arbitrary, discriminatory, and over-inclusive — with no clear process in place to discover or challenge one’s alleged gang affiliation. Like Shenery, an overwhelming majority of people in the database are young black and Latino men. Last year, the Legal Aid Society, one of several New York organizations that have demanded greater transparency from the NYPD about the database, launched a website to help New Yorkers file public records requests to learn whether they are listed in it. So far, more than 300 people have filed such requests — but police have denied every one of them. Shenery, who learned of the existence of the gang database after prosecutors called him a gang member in court, filed a Freedom of Information Law request last July to understand what earned him the label. Within a day, the NYPD denied his request. Shenery appealed and then sued in November after the NYPD responded that it had found “responsive records” for him but refused to turn them over. A spokesperson for the Manhattan District Attorney’s Office declined to comment on Shenery’s criminal case because it is still open, but referred to court documents in which prosecutors making the bond request cited his record, as well as previous failures to appear in court and a recommendation by the Criminal Justice Agency, an independent city agency that evaluates whether an individual is a candidate for release. Attorneys argue that calling someone a gang member, and providing no evidence, immediately impacts a defendant’s right to due process. Although the NYPD has said little about how it uses the “criminal group database,” as the database is known internally, it is no secret that the department shares information about alleged gang membership with prosecutors and other law enforcement agencies. It’s also clear that designation as a gang member, even when based on questionable evidence and without that evidence being disclosed to the accused or their attorneys, can have a profound impact on one’s fate in court. While gang association by itself is not a crime, prosecutors regularly use it to bolster their cases. That’s exactly what happened to Shenery. Earlier this year, the Manhattan District Attorney’s Office announced that it would no longer prosecute the possession of small quantities of marijuana, calling on legislators to legalize and regulate its use and citing the lack of “moral justification for the intolerable racial disparities that underlie enforcement.” Shenery’s arrest preceded the policy change, but in a city where marijuana use was already effectively legal for most people, he fit the profile of the New Yorker most likely to be prosecuted: young, black, and from a poor neighborhood. Before the DA’s announcement, black New Yorkers were arrested for small marijuana possession at eight times the rate of white New Yorkers. In Manhattan, black residents were arrested on low-level marijuana charges at 15 times the rate of white residents. “Gravity knives,” as prosecutors call the commonly used kind of folding knife that police found in Shenery’s pocket, have also been a controversial issue in New York City — with critics noting that criminalizing them has led to the arrest of thousands of working-class individuals, mostly people of color. While the gravity knife ban was originally intended to target dangerous switchblade-style knives, it has since been applied to even the most widely used pocketknives, common especially among manual laborers. The DA’s spokesperson told The Intercept that the office either dismisses the cases of individuals found in possession of these knives for work purposes, if they are not re-arrested within six months, or offers them a disorderly conduct plea. But attorneys say that workers continue to be arrested and prosecuted over the knives. In its response to Shenery’s request for records, the NYPD claimed that it could not disclose any records alleging his gang affiliation without revealing “non-routine” investigative techniques. But Legal Aid attorneys shot back that the techniques used by the NYPD to determine who is a gang member have already been discussed publicly, and that they are deeply problematic. At a city council hearing last June, NYPD Chief Dermot Shea testified that individuals can be added to the database if they “admit” to being members of a gang or if they are identified as such by “two independent and reliable sources.” In the absence of identification, the NYPD may choose to add an individual to the list if they meet at least two of a wide-ranging list of criteria that include one’s presence at a “known gang location,” association with “known gang members,” social media posts, scars, tattoos, and the use of gang “signs” and “colors.” One document published by The Intercept in June showed a list of colors that the NYPD considered to be associated to gangs: black, gold, yellow, red, purple, green, blue, white, brown, khaki, gray, orange, and lime green. Chief of Detectives Dermot Shea speaks during a press conference about gang violence at NYPD headquarters on June 27, 2018. Despite Shea’s testimony, when the NAACP Legal Defense and Educational Fund, or LDF, filed a public records request to obtain those criteria, the NYPD responded that it could not locate any. “Instead, the NYPD officer charged with responding to our requests insisted that NYPD personnel communicate this information verbally,” Marne Lenox, an assistant counsel at the LDF, wrote in an op-ed for the New York Daily News. “This, apparently, is the NYPD’s sophisticated ‘oversight mechanism’ to ensure the reliability of its database.” Shea did not respond to The Intercept’s questions about his testimony. The problem with such vague, broad, and apparently unwritten criteria, critics say, is that it criminalizes perfectly innocuous behavior — like having friends in one’s neighborhood — and does so in a way that is discriminatory. Prosecutors and police have regularly defended their enforcement practices as precise and surgical — even when they have led to mass raids and indictments. In law enforcement lingo, gang policing and prosecutions in the city have been “intelligence-driven” and “proactive.” But what that means in practice is that one need not have committed or intended to commit any serious or gang-related crimes in order to get swept up by law enforcement’s gang policing efforts. 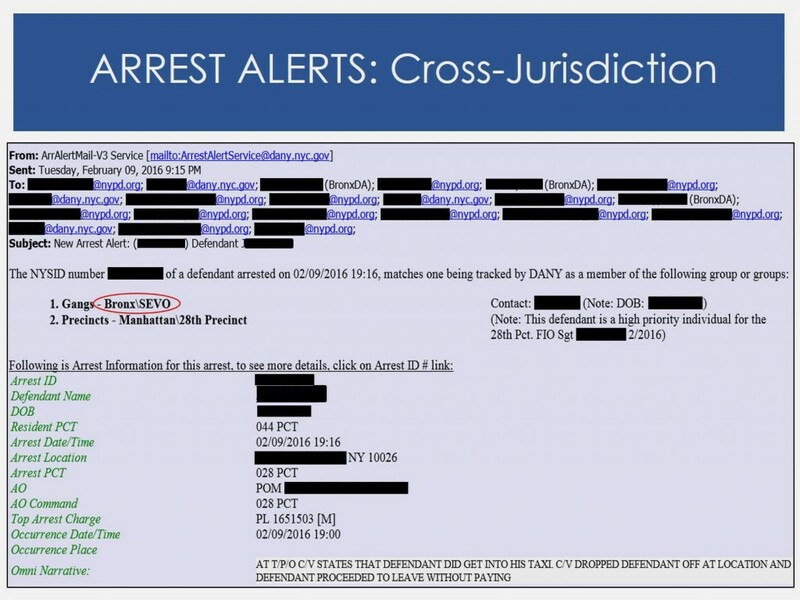 A set of documents used by the Manhattan DA’s office for training purposes, obtained by The Intercept, shows how the “gang” label, an unproven allegation, can trigger a series of consequences and enhancements for individuals coming into contact with police over sometimes minor violations. In a PowerPoint presentation prepared by the office’s Crime Strategies Unit, as well as in a report by the office about investigative innovations, prosecutors lay out how, when an arrest alert is shared between police and prosecutors across jurisdictions, an individual’s presence in a series of law enforcement lists, including the gang database, is also flagged. 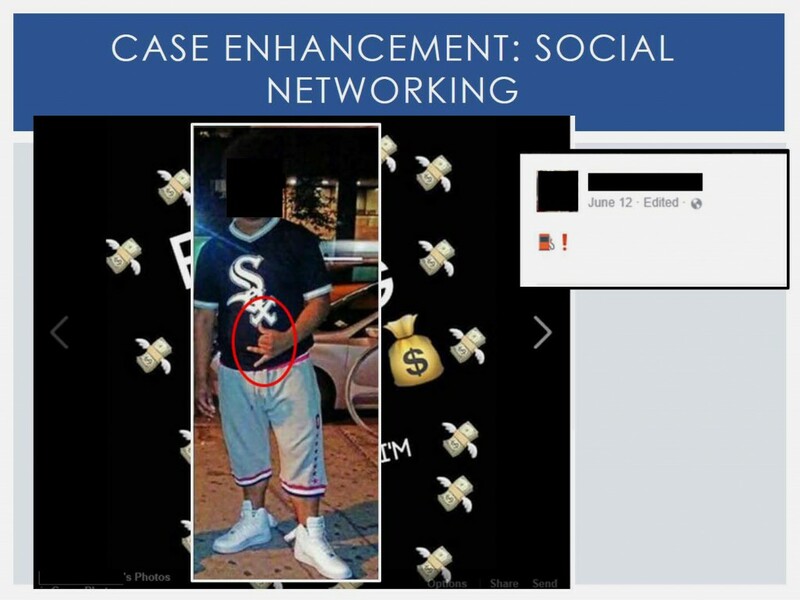 The slides also list, under the header “case enhancement,” elements like suspects’ social networks or their nicknames. The DA’s spokesperson said that “case enhancement” can refer to identifying potential investigative steps or informing bail and sentencing recommendations. Shenery’s case is a textbook example of how this works in practice. “[The gang label] was weaponized in court, so the district attorneys could add more weight to their case,” he added. Legal Aid is not the only group using the courts in an effort to force the NYPD to be more transparent about its gang policing efforts. The LDF and the Center for Constitutional Rights have sued the department over its failure to comply with public records requests about the database. Darius Charney, a senior staff attorney at CCR, called the NYPD’s gang policing practices “a black box that, like stop and frisk before them, have subjected thousands of young people of color in New York City over the past several years to police surveillance, harassment, and worse.” The LDF also filed a similar records request with the Manhattan DA, and another one with the New York City Department of Education. The gang database came under heightened scrutiny earlier this year at a city council hearing during which the NYPD disputed The Intercept’s reporting and the figures we cited about the database — even though those figures were released by the NYPD itself in response to yet another public records request. Council Member Brad Lander, who has long advocated for police oversight, told The Intercept that the hearing “raised more questions than it answered,” prompting him and others to call on the Inspector General for the NYPD, which is tasked with independently monitoring the department’s work, to investigate its gang policing practices. After the hearing, the Inspector General indicated to stakeholders that it was considering an investigation — but has yet to announce one. BuzzFeed News reported that the office was “discouraged” from scrutinizing the database by Department of Investigation head Mark Peters, who was recently fired by Mayor Bill de Blasio. The Department of Investigation, which oversees the Inspector General for the NYPD, declined to comment. Trujillo noted that the discriminatory and unchecked policing tactics the database is built on are nothing new, but the technology behind the NYPD’s growing emphasis on data-driven, proactive policing is unprecedented. But while much about the database and how it is used remains secret, its impact is already being felt. Two years of fighting his charges has left Shenery exhausted and discouraged — so much so that at one point, he considered simply taking the felony conviction. He ended up pleading guilty, but under the terms of the agreement, the felony will be reduced to a misdemeanor after a year if he meets a series of conditions. But that means he’s regularly back in court. His next hearing is on Thursday.